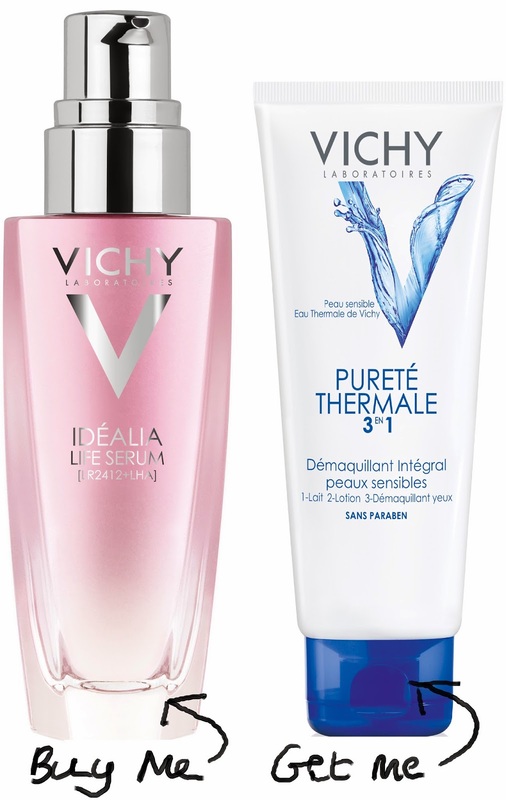 Make Up For Dolls: Promo - Vichy Mothers' Day Offer! A quick post - one for all you Vichy fans! Lack of sleep, tobacco, too much sun without protection, pollution, stress, an unbalanced diet... These realities for women of all ages become visible on the skin. Beyond genes, the time passing by or hormonal variations, the way in which we behave and interact with our environment will accelerate the ageing of our skin and alter its quality. When skin is polluted, overexposed, tired and over-stressed, it is less able to repair. Wrinkles, imperfections and dark spots occur more easily. Vichy's Idealia Life Serum contains skin quality-correcting molecules act to repair the visible impact of your life on the skin, both at the surface and through the deeper skin layers. Product claims include skin tone improvement (so long dull, grey complexion resulting from pollution), uneven skin pigmentation redress (farewell hyperpigmentation and skin marked by over-exposure to UV rays), brightening of skin expressivity (bye-bye sad, tired-looking face, dark shadows, drawn features due to stress and lack of sleep) and an overall skin balancing (reduction in enlarged pores, oily and dry patches resulting from an unbalanced diet). In other words, magical claims. It's not a product I've managed to use yet but I have heard so many good things from blogger friends, it's on my list of Things To Try at least. So here's the promo, in time for Mothers' Day (or maybe even Valentines! ), purchase an Idealia Life Serum and receive a travel size of the Purete Thermale 3in1 One Step Cleanser (100ml) free, gratis and for nothing. This is a cleansing milk, toning lotion and eye makeup remover combined in one single lightweight, non-greasy formula, especially formulated for sensitive skin. Both products are aimed at all skin types (in particular, sensitive skin), all ages (but in particular addresses anti-ageing and mature skin concerns). For mother's day, this is a great gift (and includes complimentary gift packaging to boot). Available from February in pretty much most pharmacies, another reason I love Vichy products, they're very very accessible.